Choose from our massive stock of Pit Bike parts & spares. FRIENDLY CUSTOMER SERVICE: 01789 766777. Levers, Cables & Kick starts. Pit Bike Tools & Care. Quick Action 1/4 Turn Throttle. Mini Moto & Midi Moto. 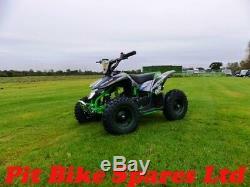 Green Mini Quad Bike PBS 49cc Pocket Bike. THE FRAME COLOUR MAY VARY. FRONT BAR COLOUR MAY VARY. GRAPHICS MAY DIFFER SLIGHTLY AND MAY REQUIRE FITTING. REAR GRAB HANDLE IS NOW TUCKED UNDER THE FAIRING. Scroll down for more pictures. Please note the quads are brand new and never run but may have marks on fairings & frames. 49cc 2 stroke mini quad bike, comes with disc brakes front and rear, metal pull start, safety lanyard, restrictable thumb throttle, mixing jug, steel 6 wheels with off road tyres. The bike is brand new and will require running on a unleaded & 2 stroke oil mix of 30-1. They are not for use on roads and not recommended for kids as they are capable of 30mph. There will be some assembly required. PLEASE NOTE THAT THE TEXT PRINTED ON THE BIKES MAY VARY. Fairings (unless damaged in carriage and notified within 24 hours with pictures). Pull starts, pull start string, pull start cogs, clutch, clutch springs. Exhaust pipes, spark plugs, t. Yres, wheels, valves, inner tubes. We will also not cover any engine parts if the correct 2 stroke mix has not been used. Normal wear and tear caused by use in accordance with the operating instructions. Accidental damage, faults caused by: improper use. Abnormal environmental conditions, overloading or insufficient maintenance. Use of the product for anything other than normal domestic purposes. Change or modification of the product in any way. Repairs or alterations not carried out by ourselves. The item must be in its original box. No box = no return. WE ONLY DISPATCH ORDERS MONDAY TO FRIDAY. Please let us know if you are having problems paying otherwise an unpaid item case will automatically start after 4 days. We are a UK based business and are specialised in Pit Bike Parts only. Our priority is our customers complete satisfaction. We provide an extensive range of parts matched with competitive prices and rapid dispatch time. Our customer services number is 01789 766777. 44mm TAPER HEADSTOCK BEARINGS SET FOR PIT BIKE 23mm. BLACK LEFT CASING, FLYWHEEL ONLY COVER FOR PIT BIKE TYPE 3. Pit Bike Flywheel Removal Tool. Pit Bike Stator Plate & Flywheel. Fits 50 to 125 Bikes. Excellent for price very pleased. Pit Bike Famous Stars & Straps Graphics Kit To Fit CRF50 Plastics. New Mark 1 Mini Dirt Bike 49cc Pocket Bike. Midi Moto Midimoto Pull Start Type 2. Mini Moto Minimoto Full Gasket Set 47cc 49cc. Mini Moto Minimoto or Mini Dirt Bike Kill Button Switch. FEEDBACK WILL ONLY BE LEFT ONCE RECEIVED. FEEDBACK IS TO BE USED ONCE YOUR SATISFIED AND IS NOT THE PLACE TO WRITE PROBLEMS WITHOUT CONTACT. WE ARE A UK BASED BUSINESS TRADING SINCE 2005 AND ARE SPECIALIZED IN PIT BIKE PARTS ONLY. We are a UK based business trading since 2005 and are specialized in Pit Bike Parts only. Our priority is our customer's complete satisfaction. We provide an extensive range of parts matched withcompetitive prices and rapid dispatch time. Keep in touch - Sign up today. Get the latest offers directly to your inbox! The item "Green Mini Quad Bike PBS 49cc Pocket Bike. Mini ATV" is in sale since Saturday, September 22, 2018. This item is in the category "Sporting Goods\Scooters\Pocket Bikes". The seller is "rhinomotad" and is located in GB. This item can be shipped to United Kingdom.